Hello sales team, and welcome to: assembling with Ashley! Today I'm going to show you how to assemble a Luxor STC11-B plastic utility cart. All you'll need are two tools - a rubber mallet and a box cutter. Great! Now that we have our tools, let's get to our box. The first step to the assembly process is just getting the unit out of the box. Make sure to cut along the taped edges of the box, without pressing to deep to cut into the cart itself. Now that our box is open, let's take parts out of the box. Unwrap each part. As you can see here we have four legs, a bottom shelf, a top shelf, and four casters - two with locking brakes. Now that we have all of our parts in order, let's take a look at the directions. Alright it's time to hammer this cart together. 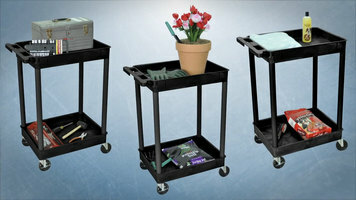 When assembling a utility cart, you can add the casters on at the beginning or at the end. I prefer to add the end, but you're free to make your own decisions. I start by putting the top shelf upside down on the ground. The four legs just hammer right into these bosses. Now that we have our four legs attached to the first shelf, let's attach the other shelf. Carefully balance it on top of the four legs. I like to hammer each leg in just a little bit for a start, and then finish all four once they have a secure connection. Great! Now all that's left is our four casters - you see two of the casters have breaks. All four casters are stem casters and swivel casters, so there's no rule which side to put your breaks on. It's a personal preference. But it's best to both on the front of back of the cart. I'll put mine on the front of the cart. These casters all have pressure rings on them that ensure a tight and secure fix to the cart. When adding the casters, you will want to force the casters in by handle, until you have fully inserted the pressure ring. If at the end you're unable to get the rest of the caster in, you can use the rubber mallet. Just be easy on your casters, because that pressure ring can get damaged if you hammer too ahrd. Okay, all that's left is flipping your cart over. That's how you assemble a Luxer utility cart. Pretty simple, huh? Did I mention the great weight capacity? Assembly is this easy for all Luxor utility carts. Assembling your Luxor utility cart is easier than ever! Watch this video for a step-by-step guide to assembling your Luxor utlity cart. Luxor STC11-B Black 2 Tub Utility Cart - 18" x 24" x 37 1/2"
Luxor BUSTC11BU Blue 2 Tub Utility Cart - 18" x 24" x 37 1/2"
Luxor STC11-G Gray 2 Tub Utility Cart - 18" x 24" x 37 1/2"
Luxor RDSTC11RD Red 2 Tub Utility Cart - 18" x 24" x 37 1/2"
Watch this video to learn more about the tub shelves that Luxor has to offer! Each tub shelf is made in the USA and is easy to install! 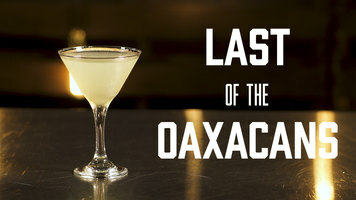 Watch this video to learn how to make a delicious Last of the Oaxacans cocktail featuring Bittermans Hellfire Habanero Shrub. 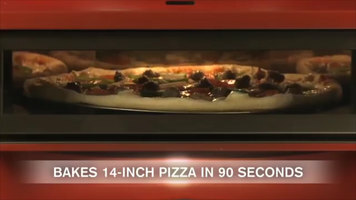 The Turbochef Fire evenly bakes artisan pizzas in as little as 90 seconds. Not only does it use catalytic technology to eliminate smoke and grease during operation, it has easy-to-use controls and is ventless for exceptional versatility.